Are you a coffee addict and one of those who is the one to find the best coffee houses during holiday? I hear you say so and I can feel the happy face as you read this post:) Here we give the best coffee houses in Barcelona for your great trip and you can choose some or drop by all of them. In Gothic Quarter Satan's Coffee Corner is waiting for you to taste the best single-origin seeds of Right Side Coffee which is one of the best coffee roasters. Watching the pass-byers nearby the window and witnessing the flow of life is really amazing. If you can't do without caffeine and need a good take away coffee shop while shopping or strolling then we highly recommend Cafes el Magnifico. It's inevitable to find many kinds of coffee. 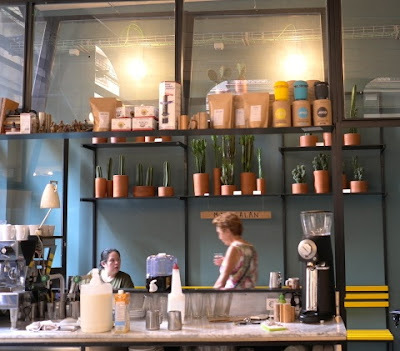 Other best coffee house in Barcelona is Nomad Coffee Lab located at a passage in Born district. You can try cold brew or iced latte! Don't you want a cake with your coffee? Then you can try chocolate oat mush. If you are travelling to Barcelona for the first time then it's highly possible to visit Parc Güell which is an art of work by Gaudi. After visiting Parc Güell keep on walking to Gracia district you will come across Syra Coffee shining with its wooden appearance and delicious desserts. Since you have come here once then you need to drop by SlowMow to try exclusive coffee that they get from the most famous coffee shop Coutume in Paris. You like the fashion and coffee at the same time? Then this coffee house in Barcelona is perfect for you. Enjoy the men outfit, art gallery and coffee at a time in Eixample district. Stop by Wer-Haus. Have a rest for a while at this relaxing coffee house. Or maybe you love feeling the spirit of being on the road and like your coffee at a coffee bus at Poblenou district which is away from popular and touristic places of Barcelona. As a tourist you may want to keep away tourist attractions for some time:). If you agree then visit Skye Coffee Co and have a drink at a original place in Barcelona. While tasting coffee wouldn't be nice to join coffee workshop and leanr some tips for the best coffee? Then don't forget to drop by Nomad Roaster's Home and if you like being in green environment choose the coolest coffee stop called Espai Joliu. Best coffee houses in Barcelona may vary according to your appetite and time. So choose the best ones and add coffee memories to your Barcelona diary. Let's get a coffee with our lovings. I hope we could be guide to your Barcelona travel much more.